Happy April! Only five more days until Easter and we are getting excited. We've been sharing lots of favorite bunny activities and egg themed activities over the past week but we still have a few more to show you! 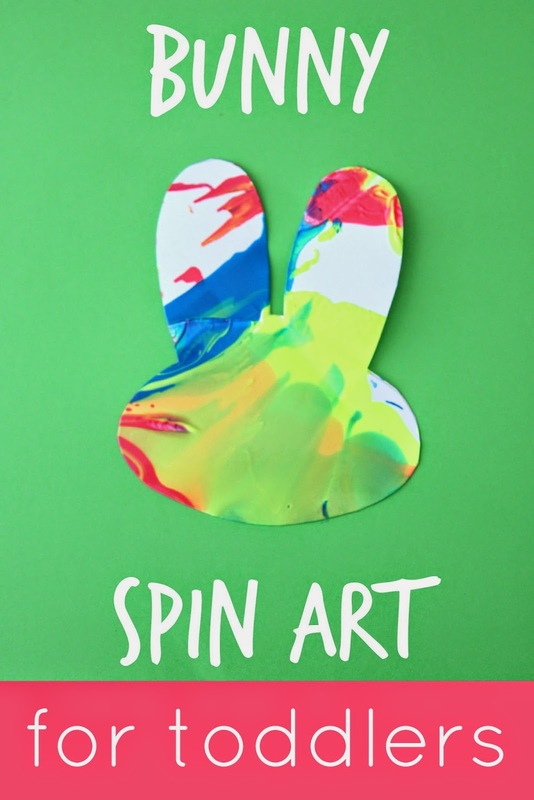 Here's a simple Easter Bunny themed spin art project that we did last week! My toddler loved this! If you don't have a salad spinner just grab a marble and a closed box and do some marble painting instead. To get started just drop your bunny cardstock image into the salad spinner and add some paint! We like to use a lot of paint to make our bunnies extra colorful. Next close the lid and spin spin spin! Once the bunnies are done spinning, take them out and let them dry! We mounted them on a colored piece of paper once we were done. You can also draw eyes, a nose, and whiskers on your if you want. My toddler especially loves checking out the pretty colors and pressing down on the salad spinner to make it move faster and to make it stop. The salad spinner we have is from OXO, but we also like the cheap ones that they have at IKEA. Do you have any other favorite Easter crafts or activities? Tell me about them!